Bayview Grand beach front Condominiums all have panoramic views of Banderas Bay, lush tropical gardens surrounding huge spectacular swimming pools. 3 bedroom, 3 bath with the best view to: ocean, beach, town and the sierra madre mountain range. Located on the 10th floor of the B building, funished and decorate with a mexican style. Jacuzzi on terrace. Service room with washer and dryer. 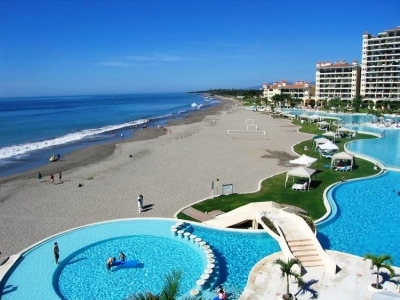 Bayview Grand is one of the great landmarks in Puerto Vallarta. Private Beach of a quarter of mile. Tennis Courts. 18 Hole championship golf course at your back door and Mexico's most sophisticated marina a 20 minute walk away with all its restaurants, shops and over 400 yachts. Homeowners fees include water and gas. Tennis court, Snack Bar, 24 hour security and on site administration.